The proper preparation of a scuba cylinder and valve for use with Enriched Air Nitrox (Nitrox) is essential for the safety of the tank user and the person filling the cylinder. The primary issue here is the introduction, even temporarily, of pure oxygen into the scuba cylinder. Pure oxygen can create flammable or explosive situations that would not be possible in regular atmospheric air. Substances that would not burn in atmospheric air burn freely in the presence of pure oxygen. Routine, everyday substances become ignition sources in a pure oxygen environment. This was demonstrated clearly in the space program fire of Apollo I, where Velcro, a popular and common substance, became explosive when used in a pure oxygen environment during capsule testing. In the scuba cylinder and its valve, the issue is the presence of hydrocarbons, or oil. When exposed to pure oxygen, hydrocarbons have a much lower flash point. To safely use a scuba cylinder for partial-pressure filling of Nitrox, special precautions must be taken to ensure that all hydrocarbons are removed from the cylinder and valve prior to use in the Nitrox filling operation. At Scuba Doctor Service and Repairs, we think that proper cleaning of scuba cylinders and valves for use with Enriched Air Nitrox (EAN) is essential. In addition, we have clear opinions about the methods that should be used in this O2 cleaning process. Many people, including some scuba store operators, feel that proper cylinder and valve O2 cleaning can be accomplished by simply filing the tank with commercial cleaning solutions and rolling the cylinder around for several minutes. The solution is then washed from the cylinder and the cylinder dried. The cylinder is then believed to be ready for Nitrox service. Actually, a little more is involved. We need to understand that the hydrocarbons we are trying to remove can easily hide in scratches, dents, and other imperfections inside the tank. In addition, hydrocarbons can stubbornly adhere to the cylinder walls by various methods, including static electricity, and may not be adequately broken down by simple exposure to the cleaning chemicals. The proper removal of these hydrocarbons requires special methods. Plus the valve used on the cylinder needs to be O2 clean as well. A complete and tested method of washing the oxygen cleaned cylinder after the cleaning process. At Scuba Doctor Service and Repairs, we use special cleaners made by a specialist in supplies and chemicals for oxygen cleaning. These special cleaners are basically made of citrus juices, combined with other chemicals and concentrated just for hydrocarbon removal. We then place the cylinder on a special rolling machine, where it is tumbled for 15 to 30 minutes. During this time, all stubborn hydrocarbons are removed from the cylinder. The cleaned cylinder is then placed on special washing stands, where it is flushed with hot running water for five to ten minutes. The cylinder is then tested for the presence of the cleaning solutions using a bubble test, a simple test that involves taking wash water samples from the cylinder and testing it for the presence of soaps. The cylinder is dried and is ready for oxygen service. Oxygen Clean In Test StickerIn addition, the valve used on the O2 clean cylinder must be O2 cleaned and prepared with special o-rings, seats, and grease designed for exposure to pure oxygen. 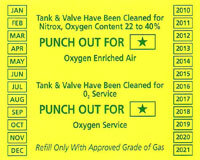 The cylinder is then banded with the familiar yellow and green Nitrox band wrap, an Oxygen clean inspection sticker is applied, and the cylinder is ready for use. Maintaining the cleanliness integrity of an oxygen cylinder is also critical. Any subsequent introduction of air that is not "oxygen compatible air" contaminates the cylinder and it is no longer suitable for partial pressure filling. Most scuba stores will not fill a Nitrox banded cylinder with normal air, unless that air comes from a Nitrox production facility, in which case it is identified as 21% Nitrox. However, the practice of filling Nitrox cylinders with standard breathing air is becoming more common place. This presents a clear problem to a facility that subsequently completes a partial-pressure fill on that cylinder. We caution our customers to be very careful when obtaining Nitrox fills, or when obtaining air fills or top ups, in their Nitrox cylinders. Cleaning is expensive, and we don't want you to waste additional money because you get an "improper" fill in your oxygen clean cylinder. PLEASE NOTE: All prices are correct as of 22 February 2016. Eventually all pieces of equipment that once were oxygen cleaned will degrade and become contaminated. The problem is that we just don't know when the contamination threshold has been crossed to create a potential dangerous situation. So regular servicing and O2 cleaning of your equipment is a must and it is recommended that any time contamination is suspected, to have the equipment serviced. Hoping that a piece of dive equipment is still clean enough is a thought that only belongs in utopia and fantasy land. 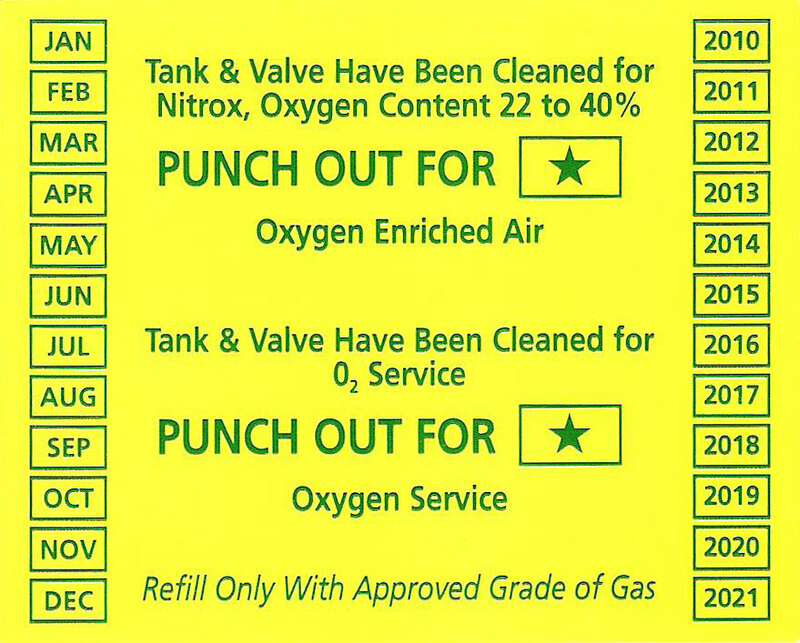 If you'd like to know more about Nitrox fills, O2 cleaning of cylinders, Nitrox stickers, banding etc. please also see Nitrox Fills and O2 Cleaning Cylinders.